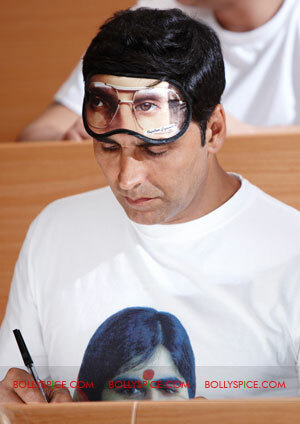 One of our favorite people to interview has to be Mr. Akshay Kumar! He is always funny, gives fabulous answers and you can feel the passion he has for every movie he makes. That is true once again for Desi Boyz, which opens Friday, November 25th. Directed by newcomer Rohit Dhawan (yes, son of comedy master David Dhawan), Desi Boyz is Akshay’s new comedy drama with John Abraham, Chitrangada Singh, and Deepika Padukone. Read on to find out about his character, more about the story that is more than we think, working with John again, and about dancing on that pole…yeah he talks about that too! Akshay Kumar on all things Desi Boyz! So what made you say yes to this role? Initially it was Rohit Dhawan and his passion for his script. He gave me the concept over two years ago now and he’s been working non stop on his script, making it the perfect vision of how John and I should be perceived, why our characters become male escorts, how lovable he wanted to make each and every scene. All these things convinced me of what a wonderful eye opening film we could make. Such a unique concept what did you think when you first heard the script? Haha – you said it yourself – ‘such a unique concept’! Indeed it was. It was brilliant. It’s what you’d call a Dramedy! It is a comedy, but not in a slapstick way at all, you definitely need to bring your heart and your funny bone to this one. It has a few surprises in store for sure, but it’s far from mindless, it’s been beautifully written. You’ve got a bit of action (not much), romance for sure, a good bit of Desi drama and a lovely lashing of comedy, but nice, not daring. Can you tell us about the story that goes along with the male dancer storyline? It’s about two friends from India who arrive in UK to study at one of the world’s most prestigious academic institutions in the world – Oxford University. However as funds soon begin to deplete, they turn their talents to male lap dancing. As they get more involved in their new found vocations, a little competition soon becomes bitter rivalry between them and the film takes audiences on a hilarious journey that follows. Give us some insight into your character. My name in the film is Jerry Patel, I am basically a guy who doesn’t care, about anything or anyone. The film demonstrates how the recession literally forces me to buck my ideas up, take some responsibility in life and knuckle down. My best friend Nick (John Abraham) and I completely run out of money and in our desperation, are offered the opportunity of becoming male escorts. Of course me being the desperate and open minded of the two of us, I of course think it’s a brilliant plan, hence the name ‘Rocco’. Rocco is my nighttime name shall we say, where baring our chests becomes a necessity for both of us. We are basically two guys who fulfill women’s fancy dress fetishes, we are not strippers, we are costume dancers. But I’m afraid the rest of this story is for the lucky viewers that go to see the film – only they get to experience the real Rocco and Jerry in me!!! How fun was it to do the male dancer sequences? Actually, both John and I were equally nervous. No man wants to look either too good or too useless on a pole, if you know what I mean! Luckily for me, my gym is made of bars and rods so I’m used to swinging from and climbing poles daily, only now I had to do it with a stripper’s flare rather than my usual monkey technique! I thoroughly enjoyed myself in the Bachelorette song where both John and I come sliding down two golden poles to entertain the ladies, it’s been brilliantly shot and it’s all in good taste. This film is made so much for families to enjoy; even your Grandma’s will have an honest twinkle in their eyes. Seems like you and John really give off a good chemistry, tell us about working with him? All I can say is we are a pair and a half, our reuniting has been well overdue and it’s been absolutely brilliant shooting with him again. The respect we both have for each other’s bodies and professionalism is immense. We have very similar backgrounds so it’s easy for us to get along so well. How has he changed since Garam Masala? He’s always worked damn hard in his career and in this film he’s giving the ladies exactly what they deserve. The only thing that has changed about him as an actor is his growth, not only in his muscles but his maturity and dedication to prove he’s more than meets the eye. How was it to work with Rohit Dhawan? What a shock the world is going to get when they see this film and realize the age, the potential, the talent, the brains and vision of this boy. Rohit is a credit to his father, he’s done a brilliant job on Desi Boyz, he knows exactly what he wants and how to get it. I’m a huge supporter of newcomers. They have passion and drive of the purest form. We work unbelievably well together as we both have one goal in mind – pleasing the audience in every single shot. I’m already looking forward to his future work – he is exactly what blockbusters are made of. With each new director, how do you change your timing and comedy to fit what he or she wants? Is that a challenge? You know, delivering authentic comedy with flawless comic timing is extremely challenging. Luckily I’ve worked with some of the best directors to champion this genre and I have a great working relationship with all of them, so you certainly feel more in sync with each other. What to you is funny? General life observations. I think you have to take things with a sense of humor and try to see the funny side to things in life, rather than letting them get you worked up or stressed out. It makes the journey that much more entertaining and laughing is so good for the soul. You are starring opposite Chitrangada Singh, what was it like to work with her? She is by far an incredible actress, not to mention stunning as well. This is of course her first commercial film in Bollywood so nerves were high but she has the ability to blow everyone away on the sets each day. An absolute pleasure to work with. Tell us about that helicopter stunt. It was up there with some of the more risky stunts I’ve completed in my time. We had to alight the helicopter without harnesses, which was daunting as I’m sure you can imagine. I think both John and I are adrenaline junkies and the thrill of it was pretty intense. I think the end result, which you’ll witness for yourselves when the movie releases, looks pretty spectacular. Any other action bits in the film? You’ve got a bit of action but not much. There is more romance, a good bit of drama and lots of great comedy! As mentioned, it’s what you would call a Dramedy! What do you think audiences are going to love about Desi Boyz? ‘Fresh’ is not the word – more like ‘Rise & Shine’ people – new director, new commercial heroine, new secret talents from both John and I… This is a story that will melt hearts both masculine and sensitive, we’ve got macho for the Boyz, we’ve got romantic for the Ladies, we’ve got action / muscles / love / dancing / morals & much more for everyone! Rohit is bringing a freshness to the screen that Indian commercial cinema has been missing, he’s worked damn hard on his script and he knows what he wants. He didn’t make me feel apprehensive for a second. New directors have a passion about them that I have become addicted to. There is never a time in a man’s life when he’s more dedicated than when he’s proving to the world what he’s made of. This is Rohit right now, in his debut element. Your favorite thing about the film. Did you enjoy filming in London? London London London, it’s a dream city to live in, work in and play in, me and my entire family, we all love it mainly for the parks & restaurants!! What are your favorite songs from the film? Some amazing things are happening – the continued collaborations with the Mainstream West and talent coming together both on and off screen. It just goes to show how much influence and impact Hindi cinema has in the global landscape. What is also great is the rise of independent Hindi cinema – some truly groundbreaking films that are proving very popular with domestic as well as overseas audiences, and showcasing new talent in the form of some wonderful directors, artists, scriptwriters and so forth. So much is happening in Hindi cinema on multiple levels. What kinds of roles will you be doing in your future projects? What is the best thing about being Akshay Kumar? The wonderful opportunities that present themselves, as well as the opportunity of being a dad and husband to the most amazing son and wife respectively. 16 queries in 0.416 seconds.